I’ll admit: if I’m going to cite GoToMeeting as a reason why the Internet works in the title of a GoToMeeting Review, then I’m probably revealing my cards a little too early. But who cares? GoToMeeting is not only a fine service, but it’s one of those mainstream revolutionary platforms that has altered the landscape for how we do business across the world. If it weren’t for companies like Citrix Online, the Internet wouldn’t be quite so easy to use as it already is. And I’m going to give it its proper recognition; if that means a glowing review, so be it. So, yes, this is going to be a flattering review. I may sound like I’m channeling my inner poet as I list the litany of reasons you should consider acquiring GoToMeeting for yourself. But as always, I’ll make an honest appraisal of the software and let you know if there are any reasons GoToMeeting might not be right for you, the individual consumer. Hey, not everything that works well is the right fit for anyone. And sometimes, the price isn’t right. But there’s plenty right about GoToMeeting: let’s find out what it is. Look how interested she is in my meeting! If you find yourself falling into that category, it’s probably best to take some time and explain what GoToMeeting is all about. First, you download the GoToMeeting software – and make the people you’re meeting with do the same. (Hey, it helps if you’re the boss, but being the boss makes a lot of things easier.) You can host meetings online with people who don’t have GoToMeeting, so don’t let that concern you. People can receive your invitations electronically or can enter in a meeting ID you give them in person. When you’ve invited people to a meeting, you are then connected in a couple of ways: via computer and via audio. People will be able to see what you’re doing on your computer and then chime in with their own thoughts via said audio. You’ll also be able to switch control of the meeting to other people and let them “sit at the keyboard,” in a sense. If that doesn’t feel like a legitimate meeting, I don’t know what does. Of course, there are about a zillion features you can use while you’re in the meeting. You’ll be able to see who’s attending, first of all. You’ll be able to record the meeting and post it so that people who missed it can catch up on the latest information and people who attended can go back and take notes. In other words, it can be the kind of software that makes you wonder why you rent all that conference room space in the first place. Once you have the basics down, you’ll start to realize that there are a number of ways you can use GoToMeeting. You can use it amongst employees, give demonstrations to clients, keep in touch when you’re on the road, and host webinars on your blog or web site. If that isn’t considered essential business software, I don’t know what is. The features and interface are simple and easy-to-use. 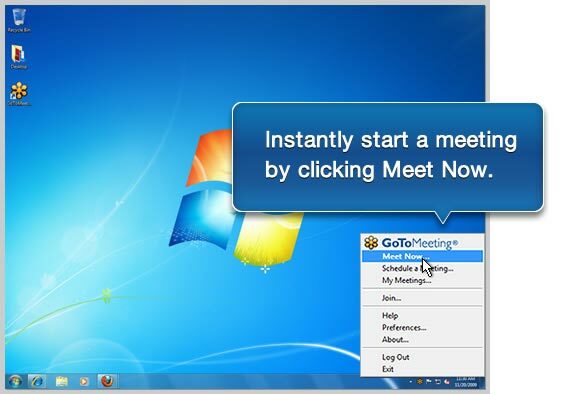 Simply opening the GoToMeeting options and selecting “Meet Now…” is enough to get the ball rolling. As you learn to use the software, you’ll find out the other ways you can employ a GoToMeeting meeting, like creating a seminar and training a number of employees remotely. Just don’t get too tempted to disappear off the face of the Earth entirely and run your business via GoToMeeting alone. Unless, of course, that’s exactly what you intend to do. You can schedule one-time or recurring meetings using this software, and given the amount of tools you’ll be able to use during an actual GoToMeeting, you shouldn’t have any problems not being there in person. Since you can still chat with people in real-time and even draw things out for them, there’s listen you’re able to do in person but won’t be able to do via GoToMeeting. All of these features should have no problem interchanging between Apples and PCs – you can also run a meeting from your iPad, which will at least give you a way of passing the time if you’re stuck in a blizzard at the airport. Hey, I warned you that I wouldn’t have many bad things to say about this service. GoToMeeting delivers the goods and keeps things as simple as possible. Even if the meeting screen is a little intimidating for you the first try, it won’t take long before you pick every bit of it up. You might have to keep poking around and trying out all the features, but eventually you’ll get the hang of it. Good software like this does have a few potential downsides, but nothing ever that serious. After all, if one downside is that you become too reliant on GoToMeeting for running your business, is that really such a bad thing? That’s like saying you used to rely on conference rooms to hold meetings. Well, of course you rely on these things! You are a business, after all. The truth is that GoToMeeting is the exact kind of tool you’ll want to have in your arsenal. One real downside is that the price can be pretty steep – the first tier of pricing will run you $49 per month or $468 per year, and this only allows you to host meetings including up to 15 people. But if you’re the kind of person who’s able to organize big-time seminars for hundreds of people, then you should have no problem affording the steeper prices of the more expensive plans. If you run a business and you find yourself needing to reach employees in a variety of ways, GoToMeeting can be one way of solidifying all of your meeting time into one efficient strategy. It’s great software – just hope you can build a business that is strong enough to need it! MegaMeeting Review: Worth the Price? I worked in a software company’s tech support call center for some time, and we used GoTo Meeting every day to help customers with their technical problems. They’d just call us up and we could easily set up a meeting for us to see each others screens in real time. I don’t know what they would have done without this program. It’s really awesome. I would love to see statistics on online meeting software usage. It seems this sort of thing has become more popular lately, not sure if it’s because of company budgetary reasons related to the economy or for the reasons you mention above, Alex. I used GoToMeeting for quite some time, and there’s no doubt about it, Citrix has some good products. But I just can’t trust hosted services anymore. I need more security, so I use RHUB’s web conferencing servers, which works from behind my firewall (instead of outside of it).